Everywhere Lily went she heard people were talking about the Halloween feast. Lily herself was looking forward to see the Great Hall with all the decorations. Albus had said the food was better than any of the other feasts. Archie didn't know what to expect. Since he had only had Muggle Halloween parties he was wondering how magic could change that. "It;s going to be amazing!" Archie said the day of the feast. "How is the food different?" "Well it's not that much different." Hugo said. "It's just more Halloween style." Luckily it was a Saturday so they didn't have to go to classes. Instead they went outside to watch James practice for the upcoming Quidditch match against Slytherin. "Who will you be cheering for?" Rose asked Albus as she warmed up her hands. "Um, half and half." He said. "If the Slytherins do something really good then I'll cheer, if the Gryffindors do something really good then I'll cheer. Problem solved." They cheered as James did a brilliant save. So far nerves weren't getting to him and Lily hoped they would never get to him. He looked over and waved at them. Lily waved back. "I can't wait for the match." Archie said to Lily. "I've always wanted to see a Quidditch game since you told me about it on the train." Lily smiled while clapping at another brilliant save by James. "The games are really fast so you might have to get used to them first." "I don't care." Archie answered. "It's going to be amazing!" "Lily. The feast is about to start." Said Jessie in her Irish accent as Lily read in her dormitory. She snapped her head up. "Oh yeah. I'll be down in a minute." She tucked the book away in between her clothes in her trunk, feeling worried someone might find it there. As she got up to leave grace entered, holding a huge stack of books. "What are they?" Lily asked. "Some books my dad sent me. They're Muggle books that he wants me to read." She smiled at Lily who noticed she was struggling. "I'll take these." Lily waved her wand and took the books out of Grace's arms then set them down on her bed. "So is your dad a Muggle?" Lily remembered the photograph she found a few weeks ago. "Yeah. He wanted me to learn Muggle stuff since I was coming to Hogwarts so I went through Muggle school and everything. 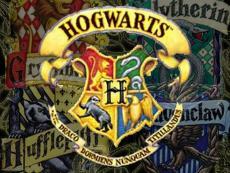 It's not as fun as Hogwarts." She smiled at Lily. There was an awkward silence after that. "Would you like to come and sit with us at the feast?" Lily offered. Grace was taken back. "You don't want to be sitting on your own. Anyway, let's get down there." Lily walked out of the dormitory and heard Grace follow. A smile spread over Lily's face. But she wasn't prepared for the Great hall. The candles in mid air had been but into pumpkins and there were bats flying around the room. Huge pumpkins were placed in the four corners and there was the Hogwarts banners across the walls. She looked up and saw it was a clear night and there was a full moon out with the stars. Every Halloween. Lily saw Hugo wave her over so she took Graces had and lead her to the table. James, Diana, Lewis, Rose, Hugo, Archie and Isaac were all at the table. There was also a boy who looked like he was in his first year but Lily had never seen him before. It had to be Teddy. "Why aren't you with Victoire?" Lily asked as she sat down. "Ahh I can't be bothered going all the way to France. Anyway, They were having the Delacour's round this year." He answered. Last year they moved to France and Victoire went with them. Lily knew Teddy was lonely in Grimmauld Place all alone. Harry had given it to him when he turned seventeen. "So who's this?" Teddy asked, looking at Grace who looked a bit awkward. "That's Grace." Lily said. "Grace, this is Teddy. He's a family friend." "How come I've seen him before?" Grace asked. Before Lily could speak Teddy had sprouted warts all over his face. Grace gasped and then McGonagall started to speak. "Welcome everyone" She said in her strict voice. "To the Halloween feast! I won't keep you too long. I can here rumbling." She clapped her hands and the food appeared. "You may eat!" Food appeared and Lily grabbed a chicken leg before anyone else. While she ate that she looked at everything else on the table. Pumpkin pie, Beetle juice, Baked potato's, Cheesy pasties. There was so many different meats Lily couldn't even name them all. "Did you ever go trick or treating?" Grace asked. Lily frowned at her. "I's when you go around to peoples houses and get sweets from them. You've never done it?" "I did." Archie said. "Don't you remember kids walking around the village on Halloween?" Lily thought back and could remember kids going around in costume on Halloween. Lily was stuffed by the time the puddings came. "I should have left room." She commented. Some of them laughed. Then only a few moments after that no one laughed. No one made a sound. The whole Great hall went quiet and still. There was only one noise. A wolves howl. Everyone screamed as the howl disappeared. People were running in between benches to find friends or family. Albus came to them. "Please! Everyone!" McGonagall called over the children. "Quiet!" "What's going on?" Archie asked Lily who was looking around at everyone else in the hall. "That's a werewolves howl." She said, finally turning to him. His face went white. "Of course they are!" Lily said angrily. Grace suddenly grabbed her arm. "Will you come to the teachers table with me?" Grace asked. "Why?" Lily questioned, not liking the worried tone in her voice. "Because that howl was too loud." She said, dragging Lily up to the front. "It couldn't be that loud after coming through walls from outside." Lily started to get her drift. "Are you saying it's in the school?" Lily asked. Grace looked round at her but kept walking. They got to the teachers table, who were all talking in a bundle. "Professor McGonagall?" Grace asked. McGonagall turned round. "What's wrong?" She asked Grace who's face was showing more panic than before. "The werewolf isn't outside. The howl was way to loud, it has to be indoors!" McGonagall thought about this for a few moments then said "You are quite right. All the children will stay here tonight." She announced to the rest of the staff." That night as Lily tried to get to sleep but the stone hard floor was to uncomfortable. She lay beside Grace and James, who was silent;y snoring. "We haven't seen any sign of it anywhere." Hitchens told the prefect, who sounded like a boy from his answer. "So do you think it's gone?" "Hopefully." Hitchens didn't sound happy. "How have they all been?" "Fine. They all went to sleep and no mucking about." Lily saw Grace slightly open her eyes, then close then again. Had she got it wrong or had the wolf just gone? It's a werewolf Lily thought to herself. It's a human being. Sometimes that was even scarier. Ahhhh!!! A Lycanthrope!!! That can't be good! I can't wait until you update this again!!! really? i can't wait til i get to christmas. lot's of things happen then!!! but just so you know. it's not teddy. teddy was at the table with them, remember? I love this story! You are so faithful to Rowling's visio. and i am fithful to Rowling. she is my idol, my hero, my inspiration to write. she is amazing and pure genius! I'm thinking Teddy's a werewolf. Oh well..